The researchers demonstrated in a video, showing how a message with special character set can crash the WhatsApp app. Previously, people found that sending a huge message with greater than 7MB can crash the WhatsApp, but this time the message found is much smaller (approximately 2KB) can also crash the WhatsApp. If you are unfortunately received this message, whenever you open that chat-room, the WhatsApp will be crashed and closed automatically. What you can do is only delete the whole conversation with that person who sends the message to you, in order to make the WhatsApp works in normal again. 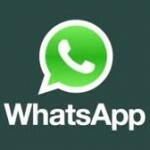 This WhatsApp bug is tested and found in most of the versions of Android system, including Jellybean and Kitkat. It has not been tested on iOS, but this attack does not work on Windows 8.1.